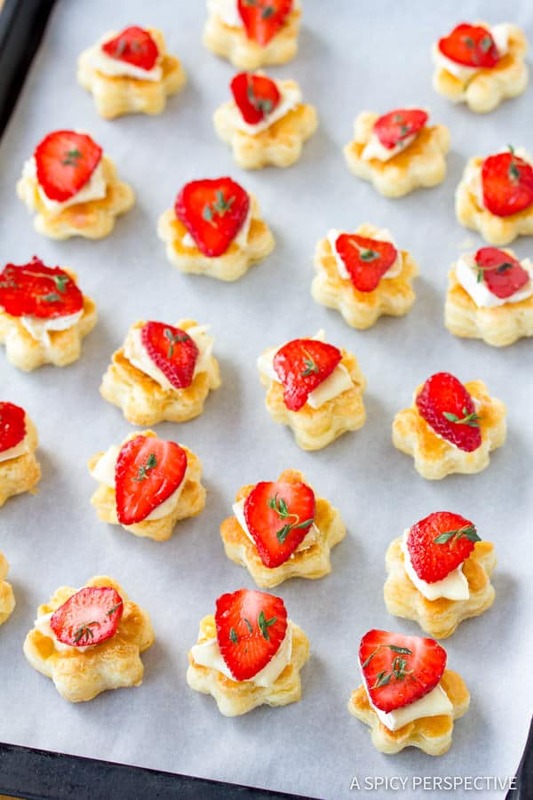 Fresh molten Strawberry Brie Tartlets, a perfect snack for parties all year long! Lt. Dan and I are party people. We are always looking for an excuse to lay out a glorious spread of edibles and aperitifs. What’s better than a warm amalgamation of friends, food and music? Not much that I can think of. We think of our home idealistically, as a meeting place where people can relax, connections are made, friendships are developed, where inspiring conversations are aroused. A place of both reasoning and laughter. Sometimes these parties are rather short notice. Frozen puff pastry is something I keep on hand at all times. It’s extremely handy for quick hors d’oeuvres and desserts. If you entertain regularly, you need to have a few tricks up your sleeve, and puff pastry is a handy tool. 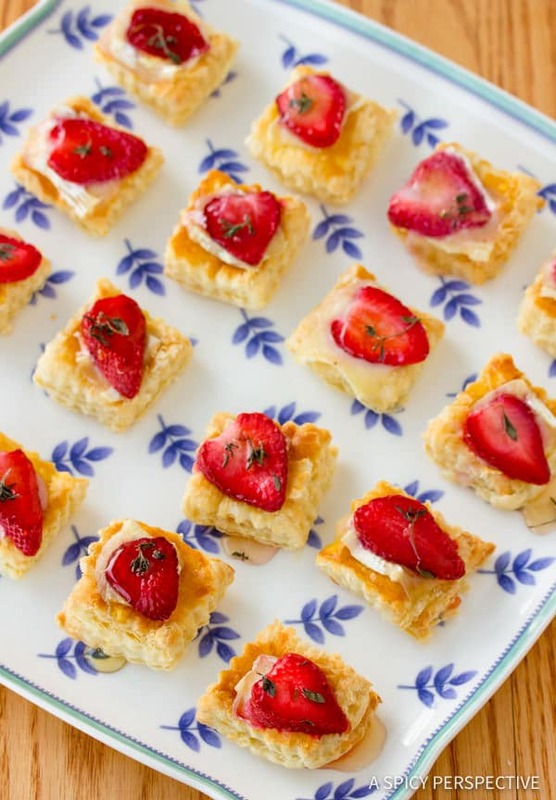 Bite-size Strawberry Brie Tartlets are perfect party nibbles that can be made in a hurry. This particular variety is essentially a deconstructed classic baked brie. I’ve layered the ingredients I might used to wrap a whole wheel of brie, and baked them into tiny bites of heaven. I find at get-togethers, friends are more likely to eat the less-messy items, especially if it’s an event where they are standing and roaming around. 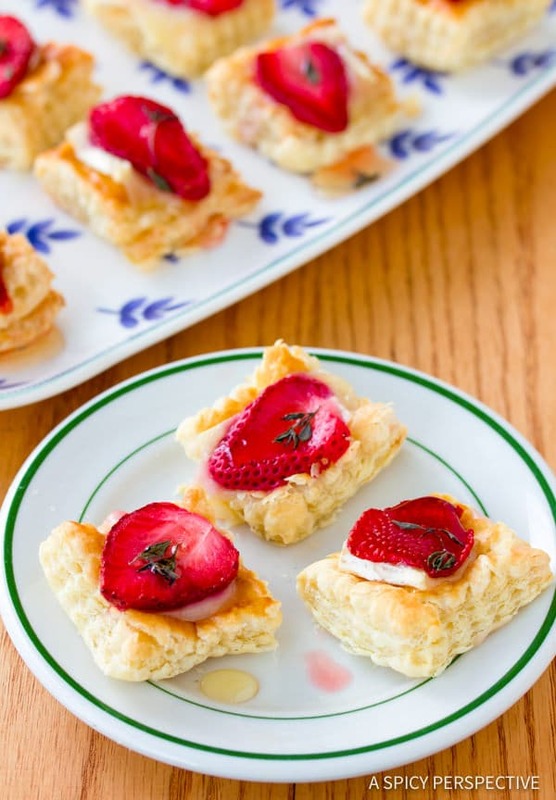 Strawberry Brie Tartlets are easy to pick up and carry. Individual tarts takes a few more minutes of assembly time, but less time in the oven than a whole baked brie. 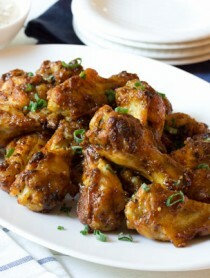 They also look lovely in a sweeping display of delicacies and are a summertime favorite. Strawberry Brie Tartlets are fabulous all year long, but I prefer them in the summer when the berries are ripe and sun-kissed! Simple Strawberry Brie Tartlets (Mini Tart Recipe) perfect for parties all year long, but especially berry season! 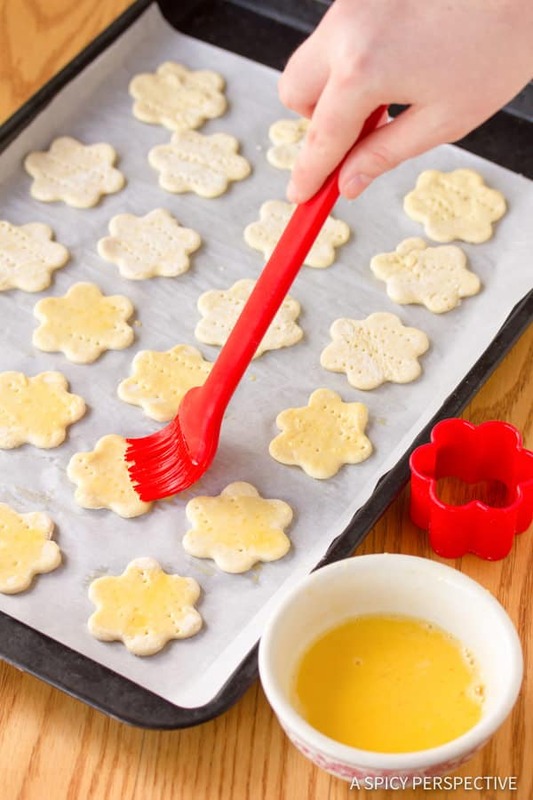 Preheat the oven to 400 degrees F. Using a 2 inch cookie cutter, cut out at least 40 pieces of pastry dough and lay them on parchment paper-lined baking sheets. Use a fork to poke holes in the center of each piece of dough to keep the centers from rising too much. Whisk together 1 egg and 1 tablespoon of water. Brush the egg wash over each piece of dough. Bake the dough for 8-10 minutes, until golden-brown. Meanwhile, slice each strawberry into 4-5 thins slices. Scrape off the rind and slice the brie into thin rectangles. Pull the thyme leaves off the stems. When the puff pastry is golden, remove it from the oven and allow the centers to collapse a little. If they don’t, poke them down with a fork. 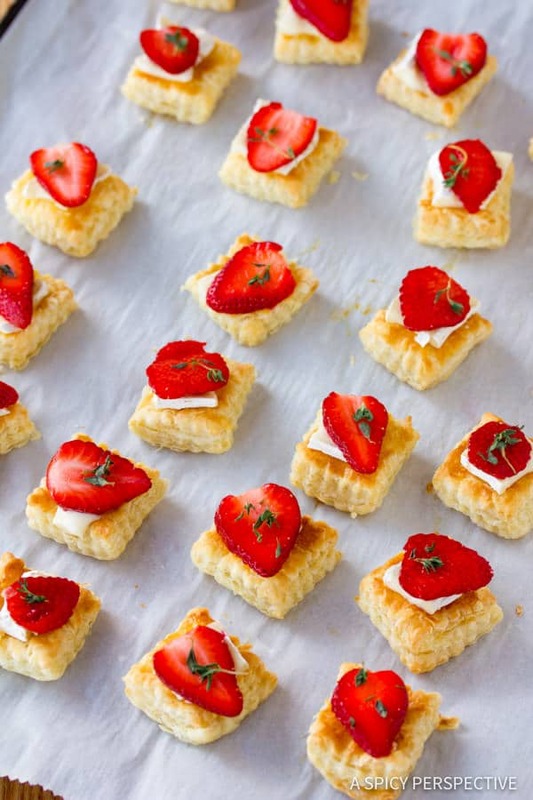 Then layer a piece of brie over each pastry, followed by a strawberry slice, a few thyme leaves and a sprinkle of salt. Bake another 2-3 minutes until the brie has melted. Drizzle with a scant amount of honey before serving. 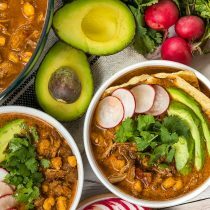 These are wonderful served warm or at room temperature! Oh my word these sound amazing! 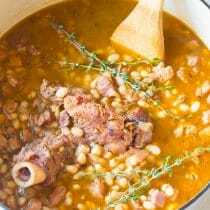 A great recipe to have on hand for parties. Brie and strawberry is so good. I love having that combo in the summer with fresh berries. These sound so good. Sommer. this is just amazing! Sadly I would have to substitute for the strawberries (allergic), but that dough and brie… Fabulous! Beautiful party food. Looks simple to make and beautiful when served. Thanks for sharing. This is so singing to me. I do love strawberries paired with brie. The thyme addition is calling summer. Wow ! Your post is giving me palpitations! I love Brie and these look gorgeous…guess what I'm buying tomorrow? Genius combination! 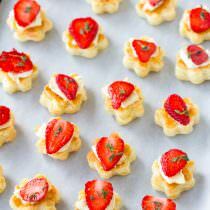 The strawberry brie tartlet recipe is going in my recipe box to make next time we host a party. Wow these are decidely different and visually fabulous! Love the size too The perfect mouthful. Sommer, I gasped when I saw these and my mouth started salivating :). I WILL be making these soon. Thank you so much for sharing this!! They look addicting. Can I be invited at your house? I love to entertain too, and those bites are perfect for one of those nights, and not too time consuming! I actually never combined strawberries and brie, but sounds like a fabulous combo! I bet the thyme added a great touch too! That is so pretty! And looks delicious. Next time you have a party, invite me! These look amazing! 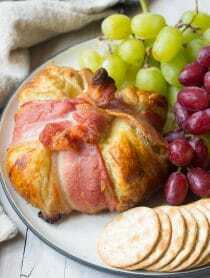 I love baked brie. These are perfect for parties! 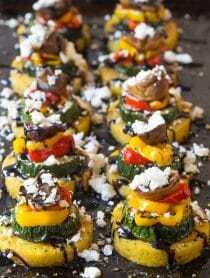 Wish I had that chance of being invited to eat these yummy tartlets. They look irresistible! These looks great. I love the combination of flavors. My husband love brie, this will be a big winner. Sommer, Totally gorgeous party material girl! Thank you for a great, feast for the belly and feast for the eyes appetizer that we can all enjoy this summer! We're totally party people too and having a repertoire of quick apps is key. And these, yep, these are being added to my list of quick AMAZING apps. Gorgeous,I bet they were really tasty. Good idea all around! Yum! The combo of strawberry and brie sounds excellent! mmmm…brie and strawberry. I think my party invitation got lost in the mail. These look wonderful. I'm coming over! These are great party appetizers! Bumper strawberry crop, so everyone should try this one. Thanks! What a great idea. My daughter loves brie – I bet she will like these. Great combination ! Not only for the start of a meal but also a great way to finish the cheese course. We are big party people here – any reason for bubbles , good friends and great food ! My husband & I are party people too! 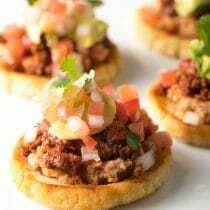 These appetizers are surely a big hit!! 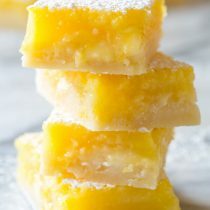 I will make them! I so love brie with strawberries: a real delight!! I am sure that these will taste great… so colorful and as mentioned a great combination of ingredients… lovely little finger food tartelets!! Wow, simple combination like this is so great. It makes sense but it never struck my mind to get it on a plate. I bet all your friends will ever be so pleased with these thoughtful tartlets.